Schoolchildren have been getting creative in a series of educational workshops inspired by the plan to build a giant bronze sculpture in Plymouth. Art and drama workshops have been held in 13 schools near to the Theatre Royal Plymouth where the city’s new sculpture will be positioned. 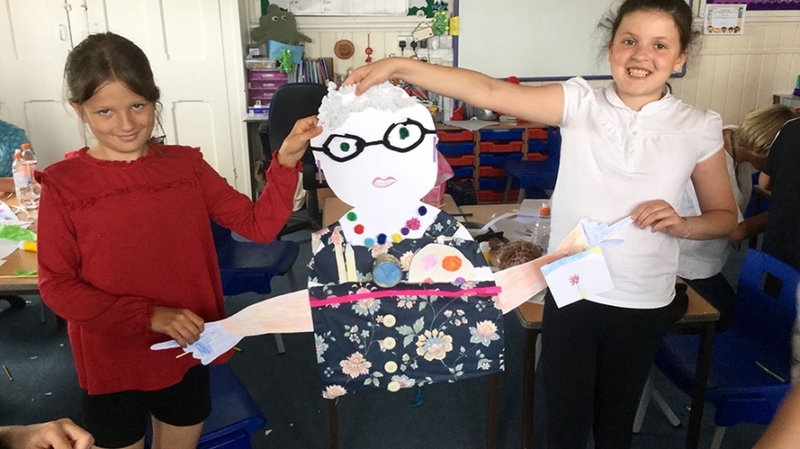 More than 300 Key Stage 2 pupils have been involved in designing their own 3D sculptures, while a further 300 have been taking part in drama workshops themed around dynamic movement. The educational workshops are part of a programme of community engagement projects in the build up to the sculpture’s arrival this winter. The aim is to educate and engage local children in what is an exciting new piece of contemporary art for Plymouth. This week it was the turn of youngsters at High Street Primary School to get their creative juices flowing. Working in groups, the Key Stage 2 pupils chose an iconic Plymouth subject to create as a 3D sculpture using scrap pieces of card, textiles, buttons, feathers and other recycled materials. Among the objects created were a seagull, octopus, Sir Francis Drake’s boat The Golden Hind, as well as famous Plymouth faces like artist Beryl Cook and Olympic diver Tom Daley. Tash Sardu, one of the practitioners leading the workshop on behalf of the Theatre Royal Plymouth, said: “We’ve been into the schools and talked to the children about the sculpture before setting them a task of making their own model. Each model has to have three or four component parts, be 3D, have an element that moves and be based on something iconic to Plymouth. “Over these workshops we’ve had some excellent creations. We’ve had Smeaton’s Tower, Drake’s Island, and even the Tamar Bridge with cars on sticks so you can move them along the bridge. In addition to the workshops, the Theatre is also planning a series of wider community engagement programmes to include a number of exhibitions. Plymouth’s bronze sculpture is currently being made at a foundry in Wales and is due to be completed in time for installation this winter.